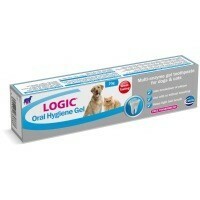 Logic Oral Hygiene Gel Pet Toothpaste is a true veterinary toothpaste, achieves results without brushing your pets teeth. Whilst brushing the teeth is known to be the most effective means of removing plaque, this is not always possible. Logic oral hygiene gel contains a multi enzyme complex which works on the plaque helping to destroy existing plaque and prevent the formation of new plaque. The gel also contains a mild abrasive, whilst the gel itself boosts the action of saliva. Supplied in a tube with applicator to allow direct application to the teeth. Dogs < 20 Kg 2 cm of gel; dogs > 20 K 5 cm gel. Mickey, the Retired greyhound, had to have 14 teeth out earlier this year. The Vet suggested we keep on with Logic toothpaste. Mickey likes the taste, and I brush it directly onto the teeth to help keep them clean. He had a review this week and the Vet said he is doing good. So I'd wholly recommend this toothpaste. Our cat and dog love the flavour of this toothpaste - they lick it off your finger. Recommended if your cat or dog doies not like a brush with a toothbrush! This is the only toothpaste I've found that actually helps remove tartar from my dogs' teeth. My vet was impressed when he saw the difference. It does require daily brushing and it takes a long time to see the results when there's bad tartar build-up, but it has saved my dogs a general anaesthetic for tartar removal by the vet. They also love the taste, unlike some of the other products I've tried on them. My 3 year old Cavalier King Charles Spaniel loves this stuff! Easy to use, no brushing required. Due to my back injury I stopped using it for a while and his teeth have certainly deteriorated. I am now back to using it with a vengeance. I opted for this toothpaste as it was the only one I could find where you didn't have to actually "brush" the teeth. I have 2 of the fussiest cats on the face of the earth but they happily lick this off of my finger and one of them even waits for more! I can't speak for how effective it is as we've only been using it a couple of days but if it saves on vet bills then I'm all for it. Also,you do get a free toothbrush should you need it. I ordered this toothpaste in error. Normally I bought Virbac CET. However, I now won't be going back to the Virbac. This product has far exceeded the results I previously achieved. Tip top toothpaste. My 2 cavaliers get their teeth cleaned twice a week and at 8 they have beautiful healthy teeth that impress the vet. They fully approve of Logic. They come running to me when they see me get the tube out and my Henry lies on his back on the floor beside me ready for his tooth-clean. They adore the taste and are prepared to put up with full brushing of even the tiny front teeth just to get the flavour. Makes the job so easy. Also I use Proden Plaque-off to keep plaque loose. I have been using this gel for quite a few years now and my 10 year old cocker spaniel seems to love it she has never had any problems with her teeth and it is a lot cheaper than the vets. I have been using Logic on my two Siamese Cats for a number of years. When I started one of my cats was due for dental work that year. When I took him for a check up it was found that he no longer needed his teeth cleaned. They love the taste and look forward to having it every morning. Our cat and dog love this toothpaste! Cheaper than the high street vet too. My moggies were adopted as adults from a local shelter 6 years ago. I don't know what their diets were like before they came to me, but I do know that, the older cats get, the more tooth problems they're likely to have. I also know that they would NOT tolerate tooth-brushing. This stuff was recommended by my vet as a way to reduce the risk of future dental decay. It's of honey-like consistency and they seem to find it very palatable - they each lick their daily doses straight from the tube. (This is just as well since, like honey, this stuff is sticky and leaves residue on upholstery, floors, etc.) I notice that, with regular use, their breath odour has improved. I also notice that it makes them drink a bit more water, which is good. I am happy that Logic Gel protects the oral health of cats without the option of tooth-brushing. Great toothpaste - my dog loves the taste of it and it does make a difference to her tartar when we brush regularly. I'm not sure how good it is on its own without brushing, but it works well with a toothbrush! This toothpaste is ideal for our old dog as he won't tolerate brushing and he seems to really like the taste. Haven't used it for long enough to tell how effective it is but am also using on our younger dog who waits for his treat every night and likes the soft finger brush supplied. I think it's keeping his breath fresh at the very least so will definitely persevere with this product. Fantastic product! I use this on my 16 yr old Cat. For the first time she needed dental treatment last year for a loose fang and plaque build up. After the operation the vet recommended this toothpaste. They say dry food is better to prevent plaque build up but as she's a wet food and dry food cat and has been all her life, i opted for the toothpaste. Took a couple of weeks for her to get use to but now she loves it, licks it straight from the tube! At each and every check up since her op the vets are always pleasantly surprised at the great shape of her teeth and gums. Not a peep of any dental issues and she loves it! (she also gets to continue with the wet food!) I'd also say it doesn't have to be used religiously, just a few times a week. Would recommend to all! i have been using the logic tooth gel for my cats for the passed 13 years,as two of my cats are prone to gingervitius, they both had to have operations,one of them back in 1998 developed gum poisoning and he had to have an emergencey operation or he possibly could of died. the operation cost me £199 and the vet then suggested this logic tooth gel which was quite new on the market at the time.it is somthing i reckomend everyone to use on their cat or dogs teeth,since i have been using it, i have had no moer problems with my cats teeth,my cats like the taste and it's so easy to put it one their paw for them to lick it off.one of my other cats she can't get enough of the taste,so she is easy to treat. a highly reckomended toothpaste for your pets. This is the only toothpaste our three dogs will tolerate. In fact they quite like it. I always clean teeth last thing at night when they are already relaxed and sleepy. My miniature poodle thinks it is his bedtime treat and is now, after about two months, letting me do all his back teeth as well as his canines, which were a problem. We started using this on recommendation from our vet and to avoid huge bills for dental work. We use finger brushes on our miniature poodles and a micro fibre finger stall on our Yorkie who at 11 doesn't want any more dental work done thank you! I`ve brushed my Birman Cats teeth with this every evening since he was a kitten. (Using soft finger brush.) At the age of 18 months now, he has developed plaque and sore gums at the back of his mouth. Which you would not expect to happen with such regular teeth cleaning. This product is good in that it has no smell or taste. So Cats will tolerate it. But it doesn`t keep your a Cats teeth as free of plaque and gums as healthy as you would expect it to. I rescued a 3yr old Shi Tzu 2yrs ago, his teeth were not good when I got him and after an eye watering vet bill for cleaning and removal of a few teeth I vowed never will he get in that state again. I clean his teeth every morning with Logic Gel, he enjoys the taste so much, that he will sit and wait by the cupboard where it's kept, waiting for me to do them and will remind me that I haven't done them - no joking. His teeth are really clean and no bad breath, a great product. Brilliant product, dogs and cat all love the taste! BRILLIANT PRODUCT & ESSENTIAL BUY. I use this every night for my little yorkie/westie cross breed, and he loves the stuff! He lets me brush his teeth easily, and the toothpaste really works well to keep his teeth clean. Plus the bonus - it obviously tastes nice because his reward for letting me brush his teeth is a small squeeze of the stuff just to lick - it's a win-win situation!! What a pleasure it is to see our Cats yawn with teeth all sparkly and white. The bonus is that they love taking the Logic as if it were a treat. My two Siamese have been using Logic for several years now. It was recommended to me by my vet as they both had a touch of gingivitis. It has certainly helped protect their teeth and gums and so far they have not had to have any surgery. I am not able to 'brush' their teeth but they love to lick the gel from my finger and it is a big treat for them each night. An excellent product. Only been using once a day for a couple of weeks and have seen good results already. I am sure using this will prevent our dog needing a tartar removal operation. Highly recommended. My cats have been using Logic hygiene gel for a couple of months now. I check their teeth regularly and they both look great. My four year old female cat had to have a gum resection last year, despite getting a biscuit only diet and I was concerned about her teeth. My old kitty, who died at age 20, had terrible problems with his teeth toward the end and I do not want my newer kitties to have the same problem. This gel is extremely palatable - both of my cats love it and will eat it straight from the tube.